Fight! Fight! | American McCarver. Your Sports Blog. When hockey is your favorite sport, fights in any other sport seem lame. Mostly because they are. Especially baseball fights. Let’s face it, we all have a barbaric side. Even if it’s just a little one. When a fight starts on the ice or the field or the court, there’s a part of you that wants to yell “FIGHT! FIGHT!” and then you hope for some fisticuffs that end with at least a little bit of blood or a few black eyes and maybe even a suspension of your rival’s star player. The baseball fight is an awkward ballet where everyone comes off the bench but no one actually does anything. It’s all very reminiscent of the Sharks and Jets, rivals dancing around each other but seeming to enjoy the dance too much to actually get down to the fighting. While the two original fighters have a dance-off in the middle of a circle, the rest of the guys are just jumping up and down to get a better look or having a staring contest with someone on the opposing team. There’s a whole lot of “Come at me, bro!” but very little actual coming at. So we spend ten or fifteen minutes watching a bunch of guys posturing and yelling obscenities while the two people who actually started the brawl are being suffocated on the bottom of a pile-up of umpires, third-string players and some coaches trying desperately to keep anyone from getting suspended. No blood. No black eyes or missing teeth. Just a few ejected players who may get an invitation to Dancing With the Stars. That’s not to say there hasn’t ever been a really good MLB fight. This 1984 game between the Braves and the Padres featured included two bench-clearing brawls. Or the 2003 showdown between Pedro Martinez and 72 year old Don Zimmer. 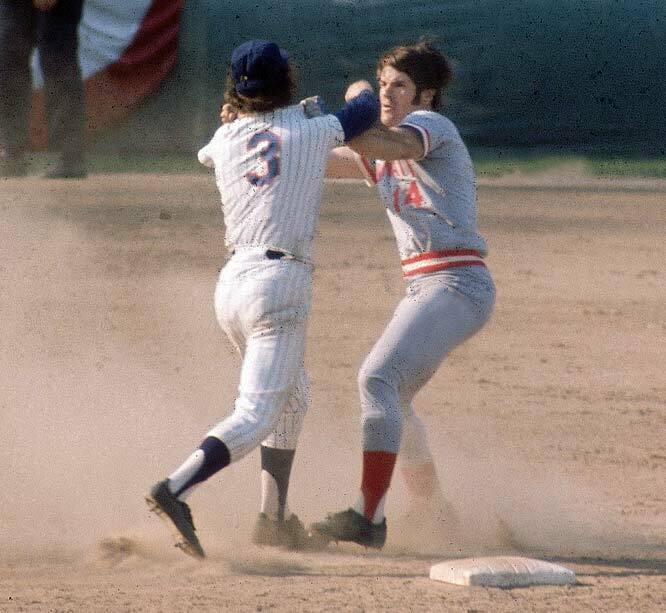 Or my personal favorite - a 1973 fight featuring American McCarver poster boy Pete Rose going up against my childhood hero Bud Harrelson. If you’re going to have a baseball fight, duke it out like they did. Or leave the fighting to hockey.